AN OPPORTUNITY was lost, but it wasn't all doom and gloom in Melbourne's rooms on Saturday evening. Despite blowing a golden chance to put an exclamation point on a thoroughly encouraging season and seal a finals berth – the first since 2006 – the mood was light and, well, kind of positive after the 16-point loss to Collingwood. Injured co-captain Jack Viney wandered about with shoulder pats of encouragement for his few dejected teammates, who emerged from behind closed doors – the grey moon boot on his damaged right foot an obvious accessory. Around the exhausted players, kids kicked footballs, toddlers played with discarded strapping tape, and fans chatted as they craned their necks to who'd ventured out of the back rooms. That inner sanctum painted a different picture with a hamstring injury adding another chapter to Jesse Hogan's tumultuous season and Nathan Jones left 'sick in the stomach'. 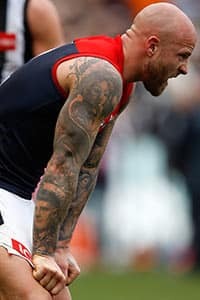 The co-captain, who did all he could to save the Demons' ship from going down and condemning them to a nervous 24 hours to see if they'd hold onto the top eight, was shattered. He emerged from a rub down frustrated, annoyed, and determined to make sure the 16-point loss counted for something if they got the chance to play on. "I feel sick in the stomach to think that quite possibly tomorrow night the year is done," Jones told AFL.com.au. "The difficult thing to swallow now is it's not in our control any more. "How do you put that into the words? It's a waiting game to see what the results are tomorrow, whether our season continues. "It's an uncomfortable situation, but it is what it is. You can't think about that now." At 29, Jones is not the oldest on the Demons' list – he's covered by Bernie Vince, Jordan Lewis and Cam Pedersen – but he is the only current player to have appeared in the club's last final. Jones was in his first season in 2006 when he played in the Dees' elimination final victory over St Kilda, and their semi-final loss to Fremantle. It's obvious what a return to the finals stage would mean to the skipper, who has now played 231 games since that Dockers' defeat. "It's so frustrating to not grab hold of our own destiny in terms of being able to control what we could today – win, and we're in," he said. "Now, we're in the lap of the Gods. "In the end, it's ruthless sport and it's a competitive game, and this season is almost like no other, it couldn't be any closer. "It is what it is now." One Melbourne official refused to give up on this year's dream, despite the lackluster showing against the Magpies. The fact the Demons lost by less than 20 points means something; it leaves West Coast needing to beat Adelaide (albeit a Taylor Walker and Daniel Talia-less Adelaide), by at least 20 points on Sunday. "There's still hope. It's all about perspective," the official said. "It's not a fait accompli we don't make it. It's not ideal, but there's still hope." In fact, some club insiders dared to believe a loss could turn out to be a positive, as it would increase the chances of a Port Adelaide at Adelaide Oval fixture, rather than having to face the finals-hardened Swans in Sydney. None of that meant anything to Jones. The captain, who gave his players a spirited quarter-time serve after they racked up just eight tackles to the Pies' 14 in the opening term, was fuming. He'll watch the Eagles-Crows game at home on Sunday, with no official team viewing scheduled. And, while he'll try not to think about what could have been if the result slips out of their favour, he'll make sure he does all he can to make Saturday's loss stand for something if they get through. "It would be a sour end to quite a promising year, but if it's not, we're excited to play whoever it is, wherever it is," he said. "I reckon we've been able to respond as a group quite often this year when we've put in a lesser performance. "We'll be ready. There's no doubt about that."